"I'm writing this letter to tell you how much the Billy Goat has meant to my 81-year old husband, who is in an electric wheelchair due to having polio in 1949. Harry has always been a hard worker, never letting his disability get him down. He played wheelchair basketball for 23 years; one of their best players, I might add. The day he came in and announced he was getting a Billy Goat, I had to laugh. I guess you know what I thought he meant! He laughed and said “No, Linda, it is a machine, not a ‘goat’!” We have trees on 3 sides of us and tons of leaves. “Billy” does an amazing job. The leaves just seem to disappear so fast into the woods. It also blows acorns once they’ve been raked into a pile. “Billy” even blows small twigs after a storm. Of course our little Jack Russel dog helps in that category; only she brings them back onto the lawn! I just wanted to let you know how much your Billy Goat has helped!" 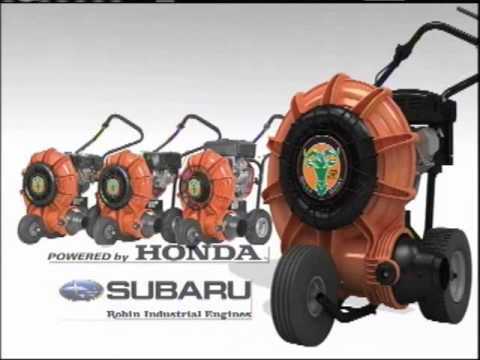 "I am the owner of a 6 HP Force blower and I love it. It's a pleasure to use. I love the handle which directs the air flow. I use to have a Little Wonder but it was way too heavy for me to use." "It has been a year and I am even happier now than when I first bought my new Billy Goat Blower! It has become one of my favorite lawn tools. I had previously owned a Little Wonder blower for 20 years and although it did the job I can honestly say that the "Goat" blows it away! Also, as I get a little older, my Billy Goat blower is much easier to use, especially with the adjustable blower control and the lighter weight. I especially like the hand control for the blower chute as it aids in removing those stubborn leaves from the lawn and allows you to pass items like the trash cans without blowing them down the driveway. I also use my "Goat" to quickly clean the garage floor and to blow light snow off the driveway. On occasion I used the blower to dry off the car after washing it. Worked quite well for everything except the hood and roof! Finally, another great feature is that it's made in the USA. Thanks again for a great product!" "The F6 better than any brand I tested! I have had a Billy Goat QB 550 for 15 years and the engine finally gave up. I looked at PECO as well as several other brands, thinking maybe there's something better out there. Well, I finally decided on the Force 6 Billy Goat and WOW! Not only is it more powerful, but the ability to direct the air is awesome -- better than any brand I tested!" "Fantastic product! The F6 blower has cut my leaf disposal time by more than half! I used to dread raking leaves. Now leaf cleanup is enjoyable!" "Bought the F601V, 205cc for my house. Any homeowner would be well advised to buy this unit! Excellent product and value. The unit weighs only 76 pounds, is easy to push, has the directional discharge for blowing the leaves which is a must, and it not only gets the leaves off, but also any other debris which is keeping your grass from growing." "Our F6 Force blower does not disappoint! It's lightweight, easy to push and pull, starts right up and is very powerful. It's relatively quiet compared to my neighbor's Little Wonder! We went to a Tractor dealership that carried Billy Goat leaf blowers. With 3/4 of an acre lot that gets pounded with leaves, we were on the fence about the F6 or the F9. After much debate, we decided on the F6. The adjustable nozzle/chute is a must for large piles of leaves (mine was 2.5 feet tall!). It cuts right through them. In short, we are very happy with our Billy Goat!" "The Force blower is an outstanding machine. I will and have recommended it to my friends in the industry. The lighter weight makes it so much easier to maneuver. The larger tires are much better on roots and uneven terrain and they don’t go flat like the Little Wonder. The handle design is excellent providing just the right amount of leverage as needed. The sound levels as well as the vibrations are greatly reduced as compared to my other blowers. Over the last 20 years, I have used all kinds of push blowers like the Little Wonder, until I got the Force. Now I will be changing over my other blowers to the Force." "I just purchased the 6 HP Force Blower and I can't believe how light yet powerful it is! I can push it with just one hand and no back pain because of the higher handle for us tall guys (6'4")! I have been using a Little Wonder for 20 years. Dependable, but it weighs a ton and is hard to maneuver. I did my acre in half the time and didn't break a sweat or get a leg cramp. I am sold on the Goat! Thanks!" Wayne Wieczorek of Des Plaines, IL. "The Force leaf blower has been a pleasure to use this season. It has saved me so much time! My family and back thank you for a great product!"